When a fisherman's rod bends under the force of a tuna, excitement rolls through his nervous system like a bolt of lightning. After all, the bluefin tuna, the largest variety of the fish, grows to more than 1,000 lbs. and 10 feet in length. Several rules, however, apply to fishing for tuna. Ignoring them can land someone a jail sentence instead of a mammoth fish. 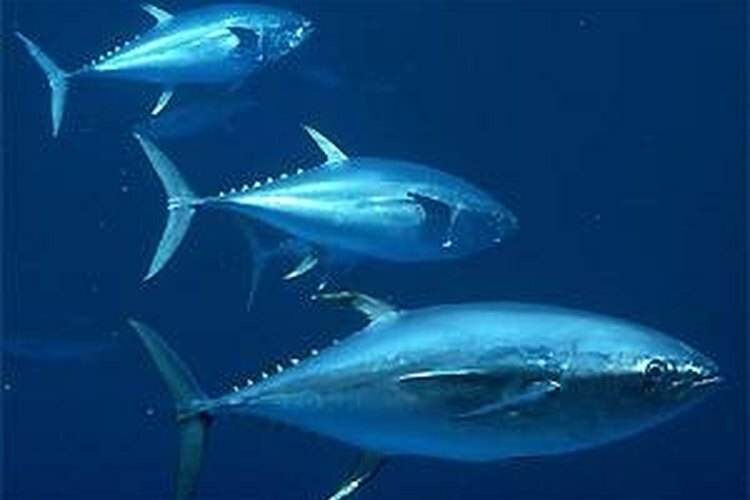 Tuna species include the bluefin, the yellowfin and albacore tuna. Bluefin are highly coveted today, and the fish, which is used in sushi, command record prices. Due to overfishing in the early years of the twenty-first century, the international community was placed under extreme pressure to set conservative standards on bluefin tuna catches. In July 16, 2009, French president Nicolas Sarkozy announced a ban on international trade in endangered northern bluefin tuna, which are native to the eastern and western Atlantic Ocean. The French approach is nothing new. Most nations set limits on the size and number of bluefin tuna a vessel can keep each day. If you want to fish for bluefin tuna in the United States, you must purchase an appropriate license and obey U.S. tuna fishing regulations. In the United States, the National Marine Fisheries Service offers three different licenses for tuna fishing. One type covers commercial fishing, and another covers charter boat fishing, where people pay to board and fish for the day. The third type is designed for recreational fishing from a boat. Shore fishing for tuna is illegal, and catching one from shore requires immediate release. A tuna fishing license only applies to the vessel. If you buy one for your boat and fish in another person's boat, your license does not apply. Also, you must have your license aboard the vessel while fishing for tuna. Unless you plan to operate a charter boat or start a commercial fishing operation, you likely need only a recreational fishing license. To purchase a recreational license, you must complete an application and pay a $16 fee. You can apply online or print an application at the NMFS website or request that one be mailed by calling NMFS customer service at (888) 872-8862. On the application, you are required to supply valid registration information for your vessel. The information must be verifiable through your state or through the U.S. Coast Guard. The application also requires the vessel's name, its home and principal ports, its length, the year it was built, the crew size, the type of construction, gross tonnage, propulsion type, engine horsepower and capacity. Once you have obtained a tuna fishing license, you are free to fish. You must, however, obey specific U.S. laws regarding fishing for tuna. Foremost, recreational fishermen are not allowed to sell their catch. The remaining laws generally pertain to the size and volume of fish. Tuna fish size is based on curved fork length, which is measured by tracing the contour of the body from the tip of the upper jaw to the fork of the tail. As of August 2009, the daily limit for those who wish to keep their catch of bluefin tuna is one per day for fish measuring 27 to 43 inches and one per day for fish measuring 47 to 73 inches. You can keep three yellowfin tuna, and each must be at least 27 inches in length. There are no recreational limits for albacore tuna. Because regulations vary according to the type of tuna that is caught, it is important to know how to differentiate between the fish. If the pectoral fin, when held flush to the side of the tuna's body, ends well before the second dorsal fin, it is most likely a bluefin tuna. If the pectoral fin extends to or past the second dorsal fin, it is more likely a yellowfin tuna. A tuna with extremely long pectoral fins is most likely an albacore. Tuna fishing rules apply to all U.S. areas other than the Gulf of Mexico, where bluefin tuna spawn. The NMFS does not allow commercial or recreational fishing targeting bluefin tuna in the Gulf of Mexico.